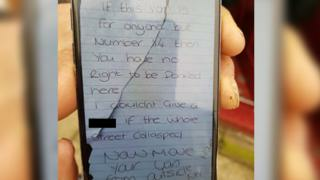 A 26-year-old woman has been arrested after an abusive note was left on an ambulance dealing with a 999 call. The handwritten message, in which the writer said she did not care "if the whole street collasped [sic]", was left in Tunstall, Stoke-on-Trent, on Sunday. Staffordshire Police said the incident was not reported, but the force took action after seeing details on Twitter. Ch Insp John Owen tweeted: "Emergency services must be able to carry out their roles without fear of abuse." The woman, from Tunstall, was arrested on suspicion of public order offences and remains in police custody. Mike Duggan, operational manager from the West Midlands Ambulance Service, said the paramedics also received verbal abuse as well as the note. "This is not solely about the note," Staffordshire Police said, "the arrest related to matters of verbal abuse." The note, which was left on the parked ambulance, read: "If this van is for anyone but Number 14 then you have no right to be parked here." The note ended by saying: "Now move your van from outside my house." Mr Duggan told the BBC he thinks people who abuse emergency staff need to be dealt with more "robustly". "What is it going to take? Is one of us going to have to die before they take it seriously?" he said. In a statement, the ambulance service said it has a "zero tolerance policy" towards abuse, which it said is "completely unacceptable and must stop". "There are unfortunately still a handful of narrow-minded individuals who consider leaving vile abusive notes acceptable," the service said.